There are many kinds of rays in the sea, and several kinds of skins we can see. Usually the ray skin used on the handle is this type. The left is a head, and the right is a tail. A ray has one large nodule on its back. The skin around the large nodule is thickest. The nodules lean toward the tail, because they are a kind of scales. The first piece that is used for the handle is cut out, it must include the large nodule. The head is toward the kashira, the tail is toward the fuchi. This is an exact rule to use ray skin, thinking the direction of the nodules. The rest are the second pieces. They are used for various tools. Before 16th century, the piece is cut from the centre of ray skin. So the large nodule is placed around the centre of the handle. In the Edo period, 17th - 19th century, most of handles have the large nodule at the end of it. Ray skin was expensive in old days, because it was imported from the southern sea. So they wanted to get a larger piece from the rest. It is used for cheaper swords sometimes. 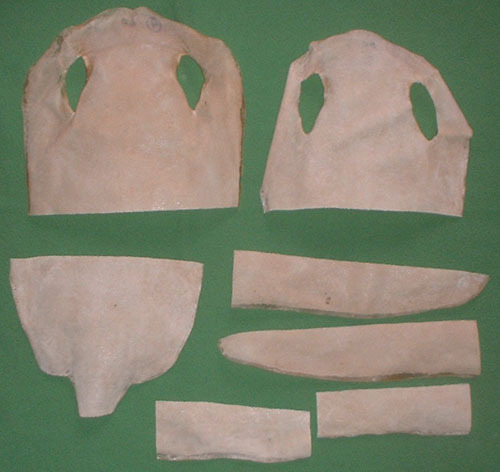 Ray skin becomes very hard in dry, and becomes soft in wet. So it is useful to make a hard handle. It has uneven thickness in parts. Around the large nodule is thickest. Craftsman wraps a wet ray to check a good fit with the handle wood, then shaves the handle wood. He makes the temporary wrapping again and again until the final work to use the glue. This style is used only for cheap swords. It is small meaning to use ray skin. Sometimes there is a line on the reverse side to trick it for Marugise. Usually it is made of the second pieces of ray skin. It is common on good quality swords. Usually the joint is at the centre of reverse side. Sometimes it can be placed near the back or near the cutting edge. An old handle wood with ray skin wrapped by the round wrapping style. This style is the most tough. But it was not common in old days. Because, it is not easy to make a good work, and expend much ray skin. We can find this style of handle only on the swords in feudal lord collections, or some Samurai's who prepare his sword carefully. An actual example of handle wood for the round and half wrapping. The kashira is a buffalo horn. The view from the cutting edge side. The view from the back side. The ray skin is wrapped up with glue. The ray skin fully covers the handle length. The fuchi is put on the rayskin, and the wood panels are settled on the ray skin to get even level. The glue between the ray and wood doesn't work now, and the ray skin is a little shortened by aging of hundred years. In Koto period, it is common to harden the ray skin with urushi lacquer, because ray skin is weak against the rain. White ray skin is used on parade swords and noble's swords. In Shinto period, white ray skin is not rare. The Edo government took the policy of national isolation, and they had been kept peace over 200 years. I wonder if ray skin became more expensive, and people forgot to prepare their sword for battle field. We have received a question from a customer. Do the craftsman prepare the mune and ha area on the ray skin with paper panels? Or does he do tsukamaki directly on the nodules? Usually the mune and ha is prepared with paper or wood panels to make a smooth surface for tsukamaki. The level between the fuch/kashira and the wrapped cord surface must be even. Some craftsman says, the panels are necessary to make a proper surface on ha/mune. Such a method is common in Edo period. A foundation work of tsukamaki. The ha and the mune are wood panels. The start and the end are black papers. The ray skin is the round and half (maedare-gise). An example of broken handle from Edo period. The ha/mune surfaces are revised with panels. 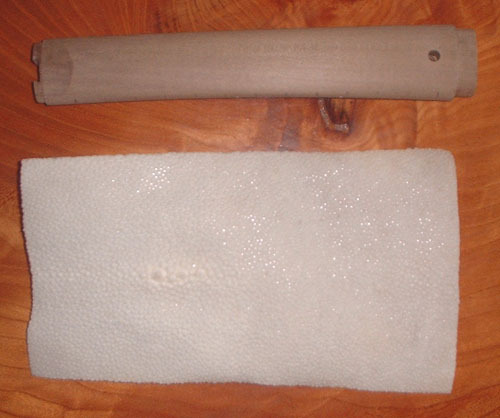 The ray skin wrapping style is Marugise (round), but the area near the fuchi is patch work with the second pieces. Another example of broken handle. There are paper panels on the ha/mune and the area start and end. Before 16th century, in Koto period, the method seems a little different. I studied some old koshirae's from the Koto period. The tsukamaki surface on ha and mune has small risings of nodules. In other words, we can see the nodules over the wrapping. That means the handle under the wrapping is not smooth, it still has nodules. So we can see that the handle has no panels on its ha/mune. It is not easy to make a even surface without panels. The work of ray skin wrapping has to be done more exactly than the case using panels. The directly wrapped handle is better to swing the sword. The wrapped cord is hard to move, because the nodules bite into the cord. Therefore the direction of the ray is important.